A signed permission form has been received stating, "I hereby grant St. John's College permission to: Make an audio recording of my lecture, and retain copies for circulation and archival preservation in the St. John's College Greenfield Library. Make an audio recording of my lecture available online. Make a typescript copy of my lecture available for circulation and archival preservation in the St. John's College Greenfield Library. Make a copy of my typescript available online." 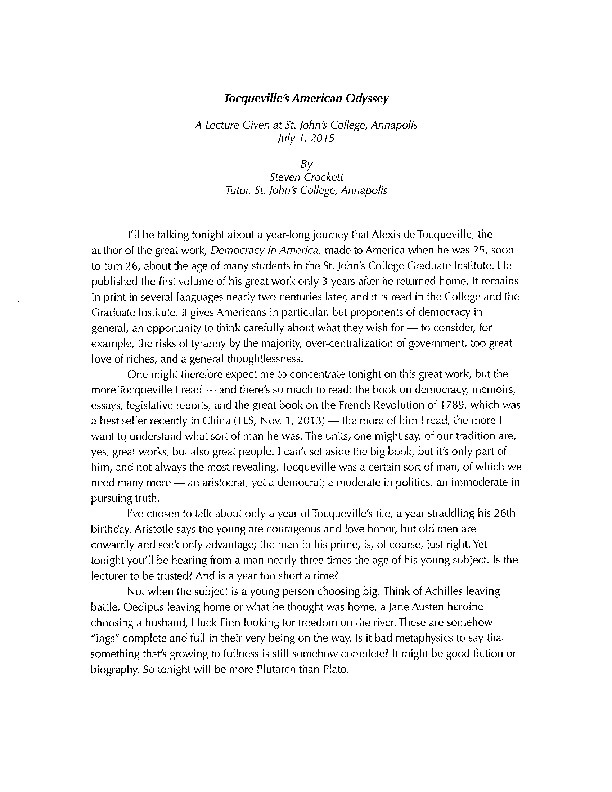 Crockett, Steven, “Toqueville's American Odyssey,” St. John's College Digital Archives, accessed April 21, 2019, http://digitalarchives.sjc.edu/items/show/323.